Press below play button to Start listening FM in IOS Devices and Android Phones . 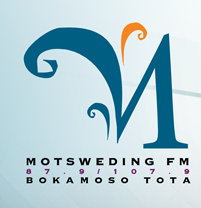 Motsweding FM Listen Live Online . This is a National radio station that broadcasts in Setswana in the North West, Northern Cape, Gauteng Province, Free State and growing in parts of Limpopo and some parts of Mpumalanga . It aims to be the contemporary voice of Setswana speaking and or understanding South Africans, acknowledging, proud and respectful of its cultural heritage .